TND – This is what happens when . . .
Other people have these moments too right? Those moments when you crash headlong into the wall that divides your expectations of the world from other people’s expectations of the world? And you’re baffled, because how could other people do this thing differently? I’m not talking about the little things you learn when you live with someone – like they tend to leave cupboard doors open, or will return empty bowls to the fridge – which granted are equally baffling, but you learn to live with them. I’m talking about times when you realize that not everyone’s mother considered knowing how to iron a shirt, or sew on buttons, or rewire a light socket essential life skills to be learned before departing the ancestral home. Because, how can you not know how to iron a shirt? Mostly the jarring sensation of running up against this wall has diminished with time – I’m not sure if that’s a sign of personal growth or whether I’ve just revised my opinion of humanity downward. Usually when it happens now it’s at work where I’m periodically faced with the realization that there are people who think that impactful is a real word, or don’t know what idiosyncratic means, or have never heard of Jane Austen (no really, you have no idea how much I wish I was exaggerating for effect). Now dinner with the Queen would make me as nervous as the next person, but for what it’s worth I can identify a caviar spoon at 50 paces, and own a full set of fish knives and forks. Amusingly, my mother can identify a stilton shovel by email (image at left – and if anyone can identify the implement on the right we’d all be grateful – my mother and I both think we’ve seen it before but can’t remember what you’d use it for). I’m not sure what being able to identify the more esoteric pieces of a silver service is worth exactly, but it is what you get when you read too many period novels and grow up in a house where leaning your elbow on the table during dinner was likely to get it smacked with the (dull) side of a knife. I’m not trying to lay claim to the world’s most impeccable table manners. Strictly speaking, given my current address (i.e. in the US) I actually have appalling table manners what with my habit of adhering to the European table etiquette I had drilled into me as a child. Also, I confess to a tiered scale of table manners. There’s what I do when I’m home eating dinner on the couch when I will occasionally eat an entire meal without using a knife (like say, poached eggs in tomato sauce – bread substitutes nicely for any possible need you’d have for a knife). There’s what I do when it’s Dinner – don’t tell my father, but sometimes I lean my elbows on the table after I’ve finished eating but before everyone else has. And, then there’s what I do if I’m out to dinner somewhere nice, or with people I don’t know extremely well, at which point I will in fact get annoyed by servers who don’t know how to open wine correctly or how to serve/remove plates from the table, and judge people on their bread eating etiquette. Surprisingly, given the lack of butter, olive oil or heavy cream involved, this is an Ina Garten recipe. It is exactly as simple as it seems (particularly if you use a food processor to mince your garlic and ginger), and it is also as spectacularly tasty as you would hope from the ingredient list. 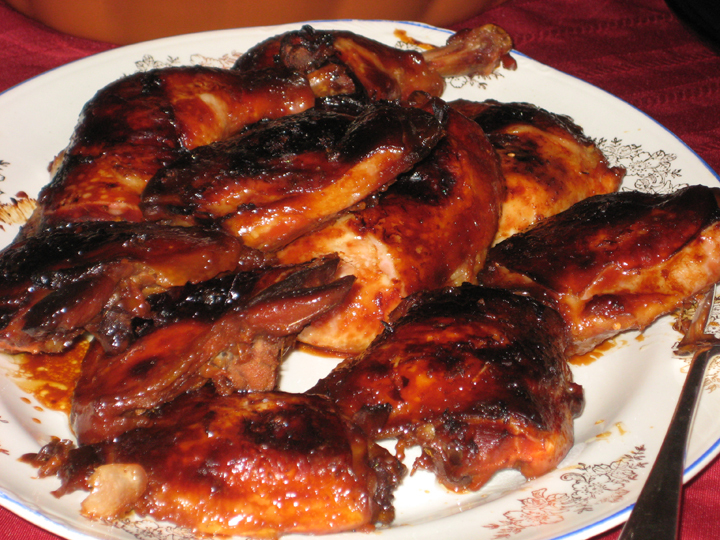 The chicken skin roasts up crisp and crackly and gorgeously lacquered by the soy sauce and honey. 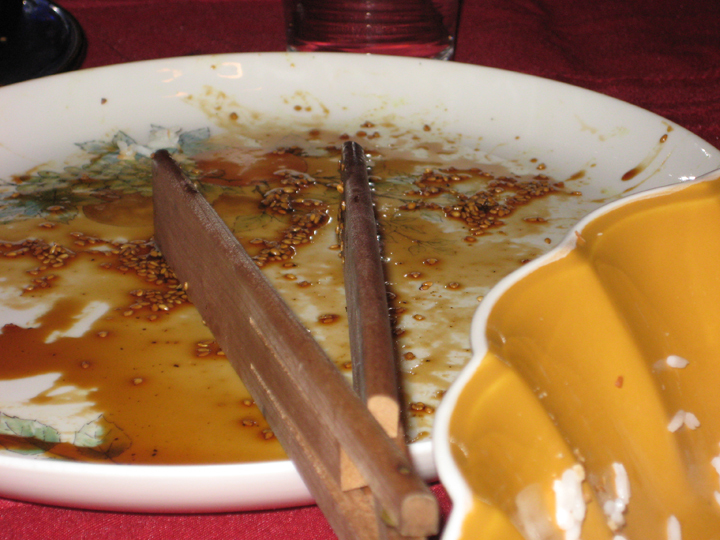 The sauce that develops from the marinade and the drippings was fought over at the table, and at the end of dinner all that was left were the bones (and those had been nibbled on at that). Melt the honey, soy sauce, garlic and ginger over a low heat until the honey is melted. Arrange the chicken in a single layer in a shallow baking pan, skin side down. Pour the sauce over. Cover tightly with aluminum foil and refrigerate overnight. Place baking pan in oven and bake for 30 minutes. Uncover pan, turn chicken skin side up and raise the oven temperature to 375. Continue to bake for 30 minutes, or until chicken is cooked through (180 for dark meat/170 for breast meat – although honestly after an hour in the oven I didn’t bother to test for doneness), and the sauce is rich and dark brown. Note: If you have a fat separator it would be great to pour your sauce into it before you pour it into a gravy boat to serve at the table. 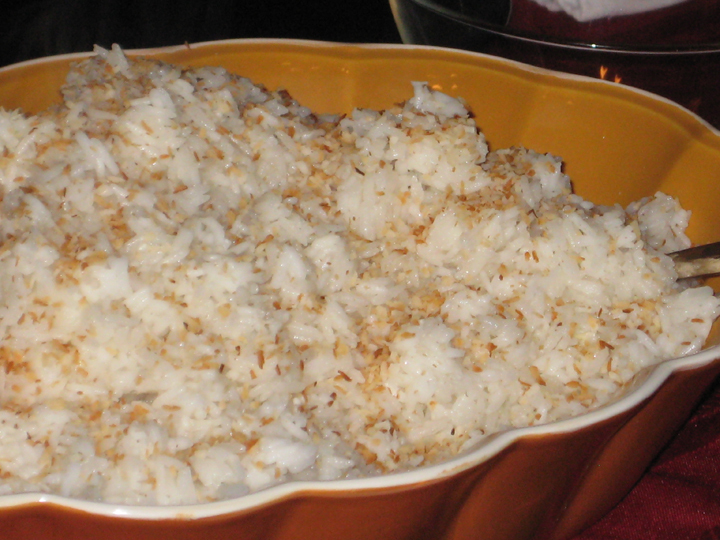 1 – I generally estimate about 1/3 cup rice/person, and when I make it for Dinner I add an extra 1/3 cup for the pot. I was serving 8 people this week and made 3 cups of rice, which is a useful 1.5x the recipe below. 2 – Apparently daun salam leaves are also known as Indian bay leaves and have a subtle spicy woodsy flavor that has no Western equivalent. I’ll be honest, I didn’t even try and find them. Maybe if I’d had this recipe made with them I’d miss them, but I haven’t so I didn’t. Place rice in a saucepan, half fill with cold water. Swirl your fingers through the rice until the water becomes cloudy with the rice’s surface starch (about 20 seconds). Be careful not to be too aggressive, you don’t want to crack or break the grains. Allow the rice to settle for a few seconds. Drain out the water. Repeat this process with three more changes of water. The water from the first two rinses will be quite cloudy; by the fourth rinse it will be much less so. The water does not need to run completely clear by the final rinse, slightly cloudy is fine. Leave the rinsed rice in the pot. Add lemongrass, cooking water, coconut milk and salt to the pot (and daun salam leaves if using). Stir well to combine, making sure lemon grass and daun salam leaves are submerged in as much rice as possible. Place pot over a high heat and bring to a noisy rolling boil, stirring every minute or so to prevent rice at the bottom of the pot from scorching or burning (will take about 10 minutes). Allow the rice to boil vigorously for 15 seconds, continuing to stir constantly (this is important, otherwise the fats and proteins in the coconut milk will cause the rice at the bottom of the pot to become gummy and stick together, which will ultimately lead to the dish having a burned bottom layer). Lower the heat to the lowest setting and cover the pot tightly with a lid. Continue to cook for 15 minutes – do not lift lid during this time, you’ll lose essential cooking steam (next time I’d let it go for 20-25 minutes). Remove the pot from the heat and allow the rice to continue to steam for an additional 10 minutes. Open the pot. Discard lemongrass and daun salam leaves. Fold the rice over gently to distribute the aromatic flavors. Transfer to a serving dish. Note – Rice is one of those annoying things that you have to cook on faith, and once it’s finished cooking there’s not much you can do to rescue it if the rice is still a little crunchy. My rice was okay, but could probably have used another 5-10 minutes of cooking before I turned off the heat to let it steam to be perfectly tender. I’m not sure if this is a function of the recipe, my stove or because I multiplied the recipe by 1.5x. I love that you can cook and shock the green beans the night before, because it means two less dishes that are dirty on Dinner night, and it’s one more thing that I can have done in advance. 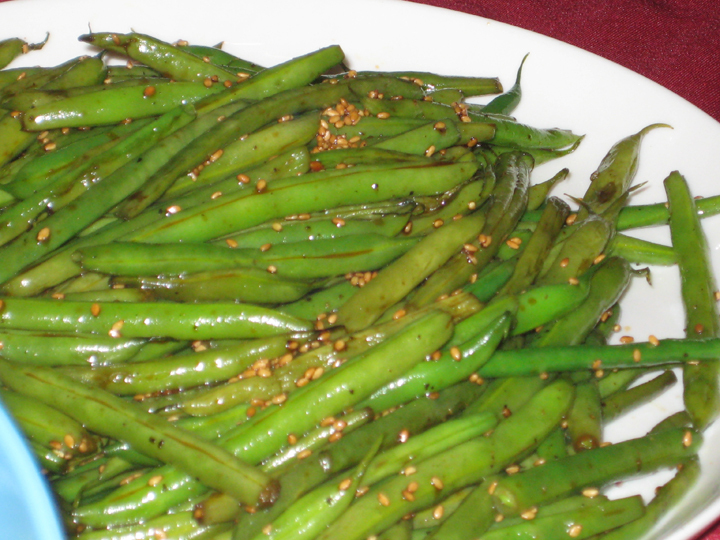 Cook green beans in a large pot of boiling water until crisp tender (2-3 minutes). Drain. Immediately shock them in an ice bath to cool. Drain again. Pat green beans dry. (Can be prepared 1 day ahead – wrap green beans in paper towels and enclose in resealable plastic bag and refrigerate). Heat oil in a large heavy skillet over high heat. Add green beans and stir fry until heated through (about 2 minutes). Add soy sauce, vinegar, sugar and pepper. Stir fry until sauce reduces slightly and loosely coats green beans (about 2 minutes more). Add sesame seed and toss to coat. Serve. ow, ow, ow, ow, ow . . . . cutting up three grapefruits, five oranges and a pineapple when your fingers are a mass of paper cuts and split skin because of the dry weather is even less fun than it sounds. That being said, the fresh citrus is a bright hit of acid that nicely balances out the heavy flavors in the rest of the meal. 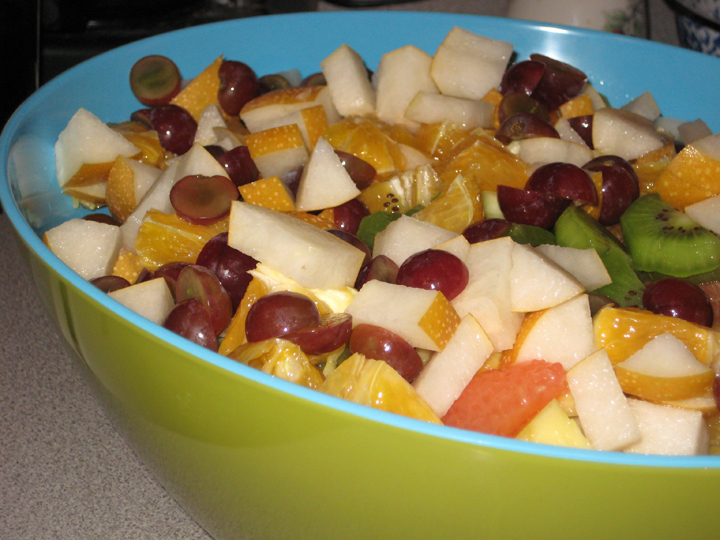 There’s no right or wrong way to make a fruit salad. I tend to pick and choose my ingredients based on what looks good that day at the grocery store. I generally don’t buy fruit that grows locally out of season, and accordingly this salad is entirely comprised of things that never grow in Massachusetts so I feel no guilt buying them in any season. If you wanted to be fancy you could chiffonade a little mint over the top, or finely chop some candied ginger to mix in, but I didn’t bother.